This entry was posted in Strength Clinics, Strength Coaching and tagged Kim Wood on February 13, 2014 by footballstrength_admin. The Pingry School in Basking Ridge NJ will be hosting its 4th annual Injury Prevention/Athletic Development clinic on Saturday February 15th. This years line up will include a coaching legend, a Division I Football coach, an Innovator in Speed and Agility Training, a professional Basketball coach and the list goes on. Here are some of the topics that will be covered: Strengthening the neck to lower concussion risks…Speed and agility training…Sports Nutrition…And much more. This is a fantastic line up of presenters who will be addressing all aspect of athletic development The main focus of this clinic is developing training programs that address the junior high and high school athlete with an emphasis on reducing injuries and protecting players. 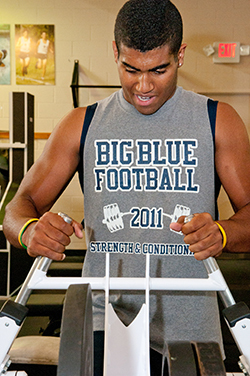 This entry was posted in Neck Training, Strength Clinics and tagged Doug Scott, Jeremy Bettle, Mike Gittleson, Pingry School on January 29, 2014 by footballstrength_admin. The Michigan State Spartan Strength & Conditioning Staff will be holding its annual clinic the weekend of February 7-8, 2014 in East Lansing, Michigan! “Tips from the Trenches with the Spartan Strength Staff” will again be a FREE event on Friday evening and will be anchored by keynote speaker, Mickey Marotti of The Ohio state University. And as always, Ken Mannie and the Spartan Strength staff will be on-hand for a roundtable discussion. CLICK HERE to download the official clinic brochure which contains directions, travel information, speaker bios and much more. This entry was posted in Strength Clinics and tagged Ken Mannie, Michigan State Clinic, Michigan State Spartans on January 24, 2014 by footballstrength_admin.